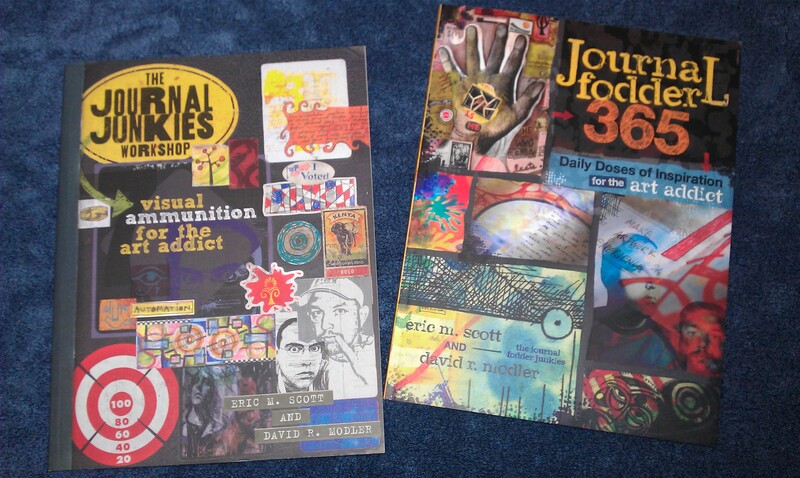 One of my absolute favourite journaling books is The Journal Junkies Workshop: Visual Ammunition for the Art Addict by Eric M. Scott and David R. Modler. Recently they released their second book, Journal Fodder 365. I was ecstatic when my husband and son got me a copy for my birthday! The Journal Junkies Workshop and Journal Fodder 365 books – don’t you feel inspired just looking at the covers? It is not about having completed, artful pages; it is about documenting our lives and throwing everything into the journal. We believe in the power of incorporating everyday life into the visual journal, and we often refer to our journals as Everything Books. We draw and write. We collage in the flotsam and jetsam of our daily experiences. We incorporate our personal and professional lives into our journal. I’d already been working my way through a list of prompts provided in the back of The Journal Junkies Workshop, but Journal Fodder 365 takes this a step further with twelve chapters (one for each month) covering twelve topics. Each topic comes with weekly prompts to further explore the subject, as well as tips and techniques for writing and art. The books are each brilliant on their own, but together make a truly awesome journaling resource. They would be a great addition to your library if you are someone just starting out with visual journaling, or are an established journaler like myself who from time to time needs an inspiration boost or likes to explore new techniques. You can purchase both books from Amazon. For visual guides like these I prefer to grab the physical books, but they are also available in Kindle format for your e-reader. This entry was posted in Journaling by Sammie. Bookmark the permalink.